This is a completely refurbished three bedroomed detached bungalow located just off Brant Road. The property has been improved and developed by the current owner and has internal accommodation to briefly comprise of Entrance Porch, Lounge, Inner Hallway newly fitted Kitchen, newly fitted Shower Room and three Bedrooms. Outside there are gardens to the front and rear, driveway and Detached Single Garage. The property also benefits from having a newly fitted (in January 2019) gas central heating boiler and uPVC double glazing. LOCATION Carral Close is located just off Brant Road to the South of the Historic Cathedral and University City of Lincoln. There is a local shopping precinct within close proximity, public house and schooling of all grades close by. Easy access and bus services into the City Centre with all the usual High Street shops, department stores, banking, allied facilities, multiplex cinema and art gallery. ENTRANCE PORCH With uPVC window and door to the front/side aspect and door leading into the Lounge. LOUNGE 11′ 6" x 17′ 0" (3.51m x 5.18m) With uPVC windows to the front and side aspects, radiator, electric fire and door to the Inner Hallway. INNER HALLWAY With doors leading to the Kitchen, three Bedrooms and Shower Room, access to the roof void and airing cupboard. SHOWER ROOM 5′ 10" x 7′ 1" (1.78m x 2.16m) With uPVC window to the side aspect, suite to comprise of shower, WC and wash hand basin, radiator and partly tiled walls. KITCHEN 10′ 3" x 8′ 3" (3.12m x 2.51m) With uPVC window and door to the side aspect, fitted with a range of base units and drawers with work surfaces over, integral oven and four ring gas hob, wall mounted units with complementary splash-backs, spaces for an automatic washing machine and fridge freezer, covered Ideal gas fired central heating boiler (installed in January 2019) and floor fan heater. BEDROOM 1 12′ 1" x 8′ 10" (3.68m x 2.69m) With uPVC window to the rear aspect and radiator. BEDROOM 2 11′ 5" x 8′ 9" (3.48m x 2.67m) With uPVC window to the rear aspect and radiator. 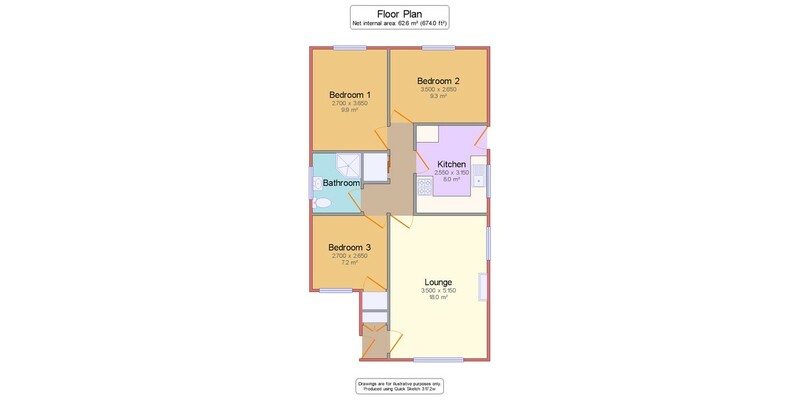 BEDROOM 3 8′ 5" x 8′ 10" (2.57m x 2.69m) With uPVC window to the front aspect, radiator and fitted wardrobes. OUTSIDE To the front of the property there is a lawned garden and driveway to the side providing off road parking for vehicles and giving access to the Detached Single Garage. To the rear of the property there is a paved area, lawned garden and shed. GARAGE 18′ 6" x 8′ 3" (5.64m x 2.51m) With double doors to the front aspect, window and door to the rear, power and lighting. A new Ideal Gas Central Heating boiler was installed in January 2019 and has a 7 Year Warranty.